Lettuce Factory: In flats, (on greenhouse bench) sow lettuce #7, 8, 9 (romaines & small varieties to interplant with peanuts). Transplant 1/3 bed lettuce (120 plants)/week. Plant #4, 5, 6 this month. Compost Needed for April: 6-9 tractor buckets for beds, 24-30 bkts to disk in. Keep celery above 55°F, and celeriac above 45°F (don’t put in coldframe). 10 consecutive days <55°F for celery, <45°F for celeriac, causes bolting. Spot lettuce, harden off in coldframe. Spot peppers, tomatoes, & eggplant. 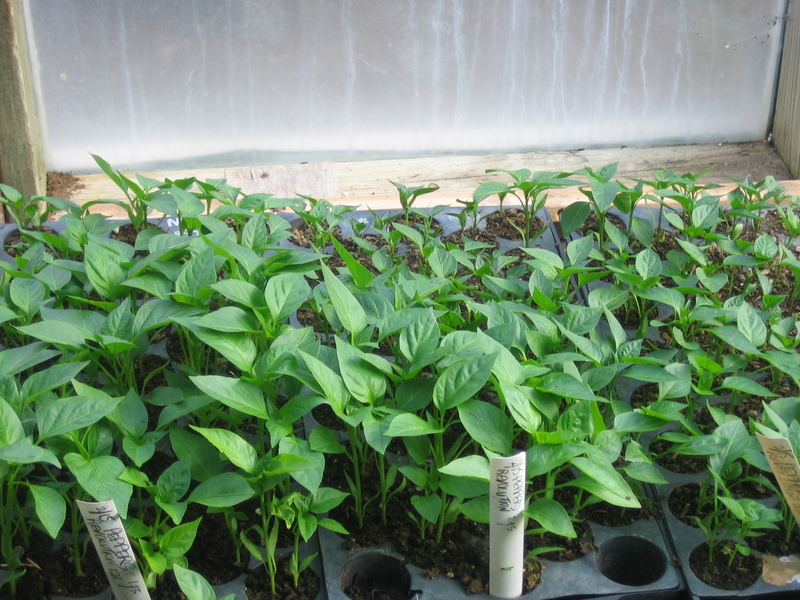 Protect new pepper seedlings from mice. Keep tomatoes above 45°F at night, eggplant above 55°F. Cut sweet potato slips at 6-12”, put in water. Once a week, plant rooted slips in 4” flats. Sow outdoors: carrots #5, beets (see March notes), parsnips with radishes #2, (in celery bed), sunflowers. Weed and thin early crops. Side dress or foliar spray over-wintered spinach to boost production. Take rowcover from turnips, senposai, cabbage #1, kohlrabi, little alliums, onions as needed for broccoli. Transplant lettuce #4, main cabbage & broccoli under rowcover (12 pieces) within 6 weeks of sowing. Till beds for mid-April. Compost beds for late April plantings. Garlic bulbing is initiated on/after April 10 (13 hours daylight), and soil temperature above 60°F. In greenhouse sow melons #1 in soil blocks or plug flats, replacement paste tomatoes, lettuce #8, and okra. Sow beans #1 when lilac in full bloom, sunflowers. Sow edamame #1, corn#1, if warm, and soil >60F. Take rowcover from kale, collards, early lettuce for raised bed tender crops. Transplant broccoli #2, insectary flowers #1, bulb fennel, lettuce #5, cukes #1 w/nasturtiums, zukes #1; use spring hoops for cucurbits. Take rowcover from spinach to strawberries. A fine bed of fava beans. 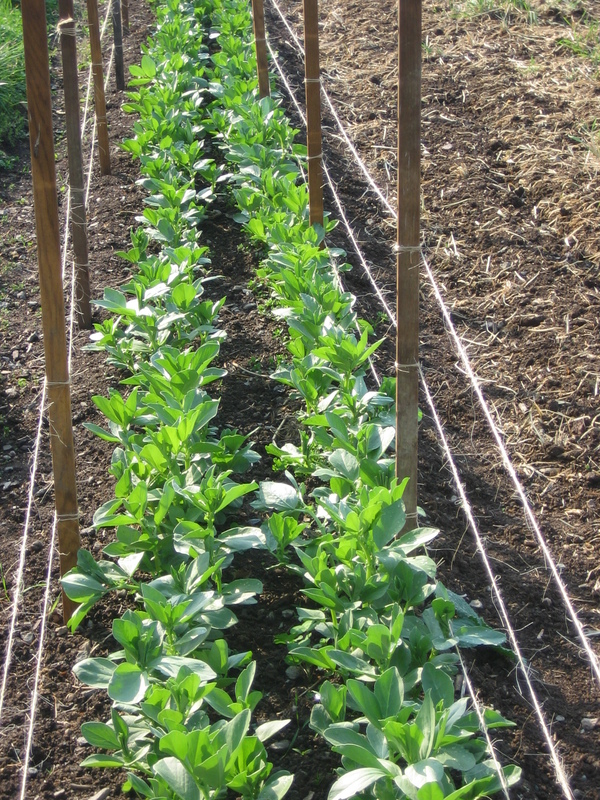 Install stakes every 8-10’ for peas and fava beans, and stringweave them to final height of that variety. #3 Spring Tractor Work (mid April) – Disk areas for sweet potatoes, winter squash, watermelons, (Romas and peppers if no-till cover crop insufficient). Bush-hog late food crop plots when rye heads up, to help clover or peas develop. Also clover patches, eg Green Fallow (All Year Cover Crops). in greenhouse sow lettuce #9; watermelons #1 & 2 in soil blocks or plug flats; calendula and various insectary flowers, filler corn & Romas. Sow corn #1 (1/2-3/4” deep) in two phases, and peanuts if soil temperature is 65°F. Also cowpeas #1, and sesame. Sow more leeks if needed in Little Alliums bed outdoors. If not, sow more mini-onions and scallions #3. Transplant lettuce #6, leaf beet, chard, insectaries; finish transplanting gaps in the main broccoli & cabbage plot, plant Alyssum. Take rowcovers from broccoli & cabbage for new crops. If mild, plant tomatoes. Harden off nightshades by restricting water. Till beds for early May (okra, toms, melons, celeriac, lettuce 7/8/9, asparagus beans). Compost beds for mid-May (edamame, eggplant, limas). Store spring and fall seeds (spinach, peas, beets) in the basement for the summer. Foliar feed the potatoes, ideally the morning before hilling up, and every 2 weeks. Roll out Driptape and Biotelos corn plastic mulch for peppers and Romas where no-till cover crop not used. Cover crops: sow rye to wimp out. Sow buckwheat in any beds not needed for at least 5 weeks eg. leeks limas; add soy if bed not needed for 7 weeks. Haybine or bush-hog vetch & rye for no-till planting of Roma paste tomatoes, late in the month (or very early in May). (Mow strips; or till strips through the cover crop for the rows, with narrow-set tiller). Water the area before digging holes, if dry. Perennials: Weed blueberries, asparagus, raspberries, strawberries, grapes as needed. Mow aisles. If asparagus weeds are getting out of hand, mow down one or more rows to keep control. Monitor asparagus beetles, spray spinosad when bees not flying, if >10 adults/100 crowns. Spinosad: Shake well, 1-4 Tbsp/gall (1fl.oz=2Tbsp=30ml.) Repeat in 6 days. 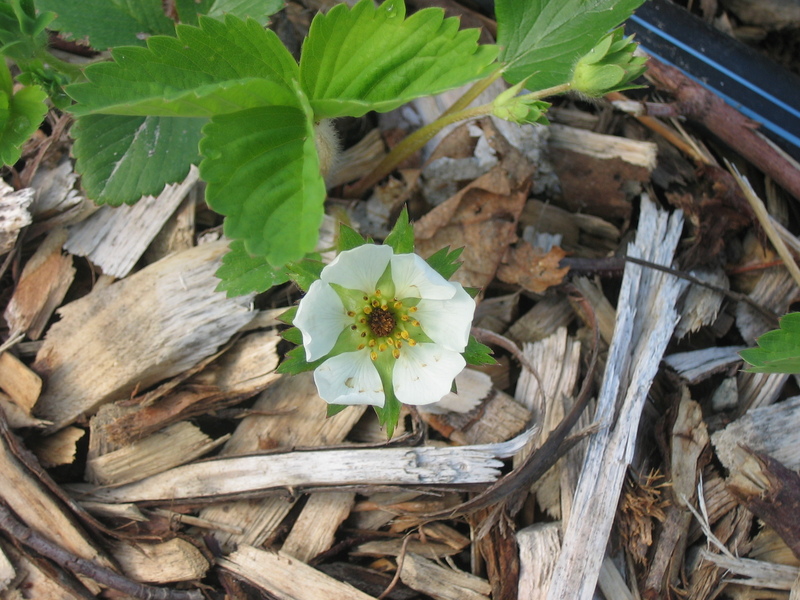 The black center of this strawberry flower show that it was hit by frost and no berry will develop. Visit grapes, log progress, remove flower buds from new vines. Note deaths and where replacement arms are needed. Check and repair fruit drip irrigation, thin raspberries to 6/foot of row. Harvest and weed: Asparagus, chard (hoophouse), collards, garlic scallions- pull at 8″, kale, leeks, lettuce, radishes, rhubarb, senposai, snap peas in hoophouse, spinach. Greenhouse interior with spring seedling flats. 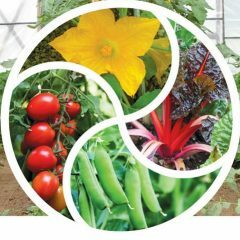 Planning: Week 1: Revise Crop Planting Quantities chart, Perennials worksheet, Harvest and Food Processing Calendars, Veg Finder, and Phenology Chart. Week 2: Revise Fall Brassicas Spreadsheet, Onion Plan and Log, Sweet Potato Plan. Revise and post Paracrew Invitation. Week 3: Write Seed Saving Letter. Revise Blueberry Map and Log, Grape Map and Log. Week 4: Revise Crop Planting Specs sheet, revise Garden Planning Calendar, File notes, prune files. Lettuce Factory: Sow lettuce #3, 4 in flats (short-day fast varieties, every 14 days). Spread compost & till beds for spinach, beets, favas, lettuce, onions, little alliums, turnips, senposai, kohlrabi, cabbage, kale, collards when soil dry enough. Till beds for carrots 1-3, with or without compost. #1 Spring Tractor Work – Compost and disk areas for broccoli and potatoes when dry enough, or till. Sow spinach outdoors if Jan sowings fail: 4oz/bed pre-sprouted. Transplant spinach from hoophouse [or flats]. Sow fava beans (seed is in peas bucket). Plant small potato onions if not done in January. 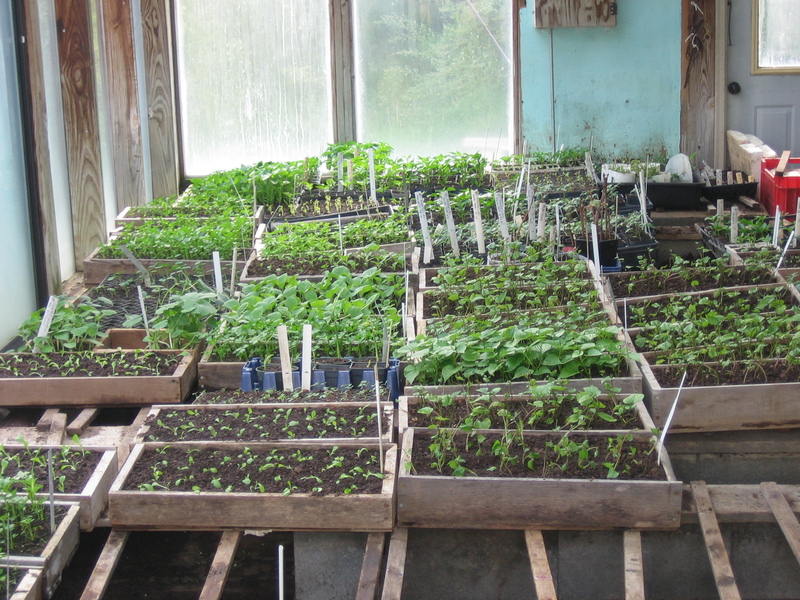 Mid-month: in greenhouse: Sow lettuce #3, and resow hoophouse peppers as needed. Spot cabbage, lettuce#3, hoophouse peppers, kale, collards, and harden off. Sow carrots #1 outdoors with indicator beets. Flameweed. Finish planting spinach, (direct sow if not enough transplants). Buy seed potatoes mid-month and set out to greensprout (chit) before planting: 65°F (19°C) and light. Really finish transplanting spinach. If needed, presprout 4oz/bed spinach for 1 week before sowing. 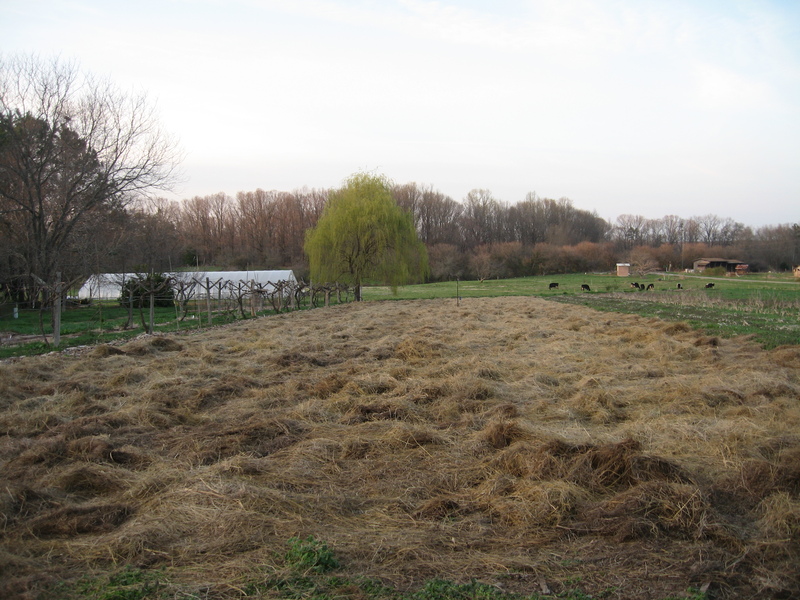 Till and sow areas for clover cover crops (eg grapes, eggplant beds), or oats, from 2/15. Transplant fall-sown onions ½-3/4” deep, when no thicker than pencils. Weed over-wintered spinach, kale, collards. In greenhouse sow broccoli #2 (2 weeks after 2nd), (shallots), lettuce #4, hoophouse cukes. Perennials: Finish weeding. Give compost, if not done in fall, including strawberries and grapes. See list for January. Transplant bushes, canes, crowns if needed. Mulch. Finish pruning blueberries, ribes. Prune grapes before 3/21 – see last year’s log notes about replacement limbs needed, etc. Summer raspberries: cut out old canes. Install irrigation. Prepare sites for new grapevines, if needed. Harvest: (Chard? ), collards, kale, spinach, leeks. Yes, really! On January 17, I sowed flats of cabbage, lettuce and mini-onions (cipollini), and the cabbage and lettuce are already up. Onions usually take 10 days, so I’m not surprised not to see them yet. It’s fun to see new seedlings, even though my energy isn’t ready for taking on another growing season yet. I’m still enjoying hibernation! The cabbage varieties are Early Jersey Wakefield, a quick-growing small pointy-head open-pollinated variety, and Faroa, a quick-growing fairly small round hybrid that has been very reliable for us. These are for a bed of early cabbage, to eat after our stored winter cabbage is all gone. We’ll sow our main-crop cabbage on 2/7, in much bigger quantities. I sowed two lettuces: reliable old Salad Bowl and the unusual Cracoviensis, a pink veined sturdy leaf lettuce, that we have found is only useful for us at this first sowing. It bolts too easily once it gets even faintly warm. It tends not to get bitter even when bolting, but our diners aren’t going to believe that! We’re also still busy with various stages of our garden planning. yesterday I updated our harvest calendar, which tells our cooks which crops they can expect when, and also our food processing calendar to tell the food processing crew when to be ready to tackle large amounts of broccoli, beans or paste tomatoes, for example. I’m part way through revising the document we call our garden calendar, which is really a month-by-month task list. If you were following this blog in the fall, you’ll remember some of those monthly garden task lists. We’ve planned which crops are going in which of the 60 permanent raised beds and identified the ones we need to spread compost on and till first. And then we twiddle our thumbs – lots of rain last week (and a bit of snow) mean it will be a couple more weeks before the soil is dry enough to till. Planning: Prune the catalogs, do the filing, consolidate notes on varieties and quantities. Week 1: Finalize seed orders, if not done in December. Revise Seedling Schedule using seed order. : Revise Outdoor Planting Schedule. Plan labor needs for the year. : Revise Raised Bed Planning Chart. Plan raised beds for Feb-June. Week 4: Revise Garden Calendar, Lettuce List and lettuce Log. Repair greenhouse and coldframes and tidy. Check germinator-fridge and heat mat. Repair flats, and make new if needed. Make stakes. Clean labels. Check equipment: rototiller, discs, and mower – repair or replace as needed. Repair and sharpen tools. Freeze out greenhouse to kill pests, or spray with soap or cinnamon oil every five days. Import ladybugs. Check potatoes, sweet potatoes and squash in storage. 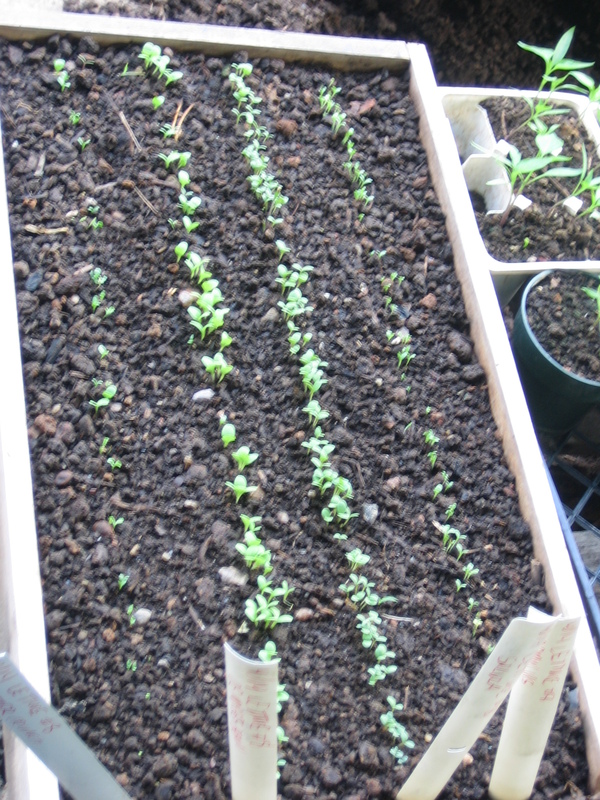 Mid-Jan: In greenhouse sow lettuce #1, early cabbage, mini-onions, early broccoli, onions. Plant small potato onions, 4-5″ apart, ½-1” deep, in a mild spell. Remove mulch to plant, then replace it. Plant shallots & mulch. Perennials (see November list). Weed blueberries, raspberries, asparagus (spread compost), grapes, rhubarb, strawberries. Add soil amendments, fertilize (not strawberries) and mulch. Prune blueberries, (take cuttings if wanted). Fall raspberries: cut all canes to the ground, remove canes from aisles. Summer raspberries: remove old fruiting canes & canes from aisles. Harvest: (Chard? ), collards, kale, (senposai?) spinach, leeks, (Yukina Savoy?). 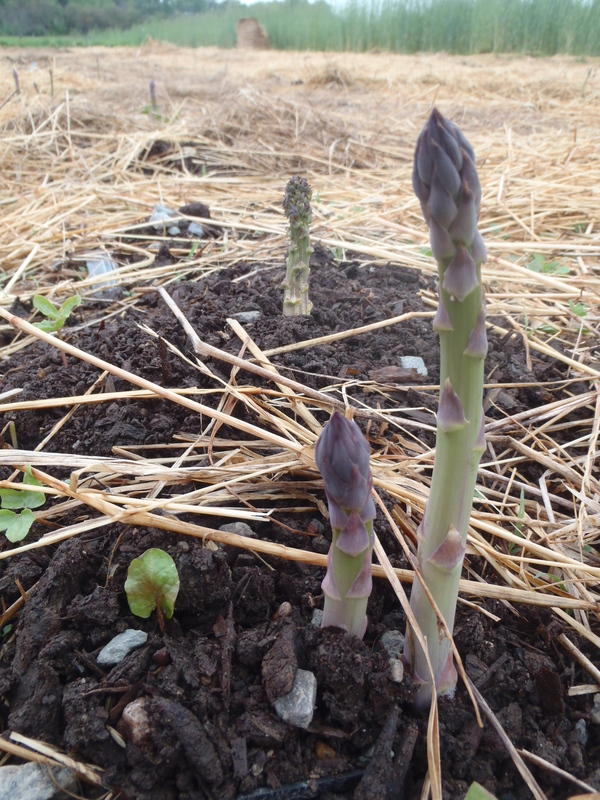 Our freshly mulched asparagus patch.